The USDA Human Nutrition Research Center on Aging (HNRCA) building was still under construction when Jeffrey Blumberg was recruited in 1981. Mohsen Meydani and Jacob Selhub waited for the paint to dry, arriving in 1983 and 1987, respectively. 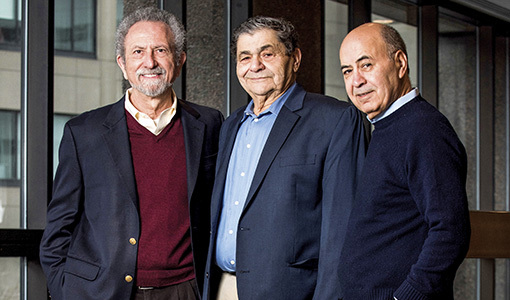 Although retiring from their labs this year, these HNRCA stalwarts, who were named Friedman School emeritus professors in May, continue to inspire discovery and collegiality. As director of the Antioxidants Research Laboratory, Blumberg investigated the role dietary antioxidants play in preventing damage to cells from oxidative stress and inflammation. More recently, he has focused on elucidating the health benefits of bioactive compounds called polyphenols. “People now talk about red wine and dark chocolate and green tea as healthful—our work contributed to that discussion,” he said. When Joel Mason, now director of the Vitamins and Carcinogenesis Lab, came to the HNRCA as a postdoctoral fellow, Blumberg was very supportive. “He was one of those senior investigators who was always receptive to helping young emerging investigators such as myself navigate the turbulent waters of biomedical research, and he did so with a very supportive and encouraging tone,” Mason said. Meydani has explored the health benefits of vitamin E, oats, turmeric, green tea, mushrooms, and many foods we eat every day. While it has been gratifying to show how what we eat can change our risk for disease, he said, the most exciting part has been discovering how benefits work on the molecular level, seeing how compounds modulate microprocesses that affect cells. As the director of the Vascular Biology Laboratory, Meydani has focused on the role foods play in the formation of blood vessels and the development of cardiovascular disease. Once called “the oat expert” by The New York Times, Meydani discovered that oats do more than lower cholesterol. A component of oats called avenanthramide counteracts the buildup of plaque leading to atherosclerosis in two ways: by inhibiting the proliferation of smooth muscles in the linings of blood vessels, and suppressing the adhesive molecules that glue blood cells to artery walls. Meydani also gave us insight into curcumin—a bioactive compound in turmeric that he found increased fat burning in mice. A human study on curcumin is due to finish this summer. Selhub said it has always been the intellectual aspect of the research that satisfied him. “Nothing else. I was not always looking to further my career; I just want to make sure I do good research, to create new concepts that can be proven,” he said.